The Miao is an ethnic group belonging to South China, and is recognized by the government of China as one of the 55 official minority groups. Miao is a Chinese term and does not reflect the self-designations of the component groups of people, which include (with some variant spellings) Hmong, Hmub, Xong (Qo-Xiong), and A-Hmao. The Chinese government has grouped these people and other non-Miao peoples together as one group, whose members may not necessarily be either linguistically or culturally related, though the majority are members of Miao-Yao language family, which includes the Hmong, Hmub, Xong and A-Hmao and the majority do share cultural similarities. Because of the previously given reasons, many Miao peoples cannot communicate with each other in their native tongues and have different histories and cultures. A few groups designated as Miao by the PRC do not even agree that they belong to the ethnic group, though most Miao groups, such as the Hmong and Hmub, do agree with the collective grouping as a single ethnic group – Miao. The Miao live primarily in southern China's mountains, in the provinces of Guizhou, Yunnan, Sichuan, Hubei, Hunan, Guangxi, Guangdong and Hainan. Some sub-groups of the Miao, most notably the Hmong people, have migrated out of China into Southeast Asia (Burma (Myanmar), northern Vietnam, Laos and Thailand). Following the communist takeover of Laos in 1975, a large group of Hmong refugees resettled in several Western nations, mainly in the United States, France, and Australia. Miao musicians from the Langde Miao Ethnic Village, Guizhou. Miao girls also from Lang De, Guizhou, awaiting their turn to perform. Young Miao woman in Yangshuo County. The term "Miao" gained official status in 1949 as a minzu (ethnic group) encompassing a group of linguistically-related ethnic minorities in Southwest China. This was part of a larger effort to identify and classify minority groups to clarify their role in the national government, including establishing autonomous administrative divisions and allocating the seats for representatives in provincial and national government. Historically, the term "Miao" had been applied inconsistently to a variety of non-Han peoples. Early Western writers used Chinese-based names in various transcriptions: Miao, Miao-tse, Miao-tsze, Meau, Meo, mo, Miao-tseu etc. In Southeast Asian contexts words derived from the Chinese "Miao" took on a sense which was perceived as derogatory by the Hmong subgroup living in that region. There has been a recent tendency by Hmong Americans to group all Miao peoples together under the term Hmong because of the perceived potential derogatory use of the term Miao. This, however, fails to recognize that the Hmong are only a subgroup within the broader linguistic and cultural family of Miao people and the vast majority of Miao people do not classify themselves as Hmong and have their own names for themselves. In China, however, the term has no such context and is used by the Miao people themselves, of every group. The increased presence of the Hmong subgroup outside of China has led to a situation where the entire Miao linguistic/cultural family is sometimes mistakenly referred to as Hmong in English language sources. Following the recent increased interaction of Hmong in the West with Miao in China, it is reported that some non-Hmong Miao who are previously completely unaware of the English term "Hmong", have even begun to mistakenly identify themselves as Hmong, because of the promotion of the term by Hmong Americans in English. However, most non-Hmong Miao in China are unfamiliar with the term as referring to their entire group and continue to use "Miao", or their own separate ethnic self-designation. According to the 2000 census, the number of Miao in China was estimated to be about 9.6 million. Outside of China, members of the Miao linguistic/cultural family sub-group or nations of the Hmong live in Thailand, Laos, Vietnam and Burma due to outward migrations starting in the 18th century. As a result of recent migrations in the aftermath of the Indochina and Vietnam Wars from 1949–75, many Hmong people now live in the United States, French Guiana, France and Australia. Altogether, there are approximately 8 million speakers in the Miao language family. This language family, which consists of 6 languages and around 35 dialects (some of which are mutually intelligible) belongs to the Hmong/Miao branch of the Hmong–Mien (Miao–Yao) language family. The Hmong live primarily in the northern mountainous reaches of Southeast Asia including Thailand, Laos and Vietnam, and in far Southwest China mostly in the provinces of Yunnan, Guangxi, and to a very limited extent in Guizhou. There are about 1.5–2 million Hmong in China. 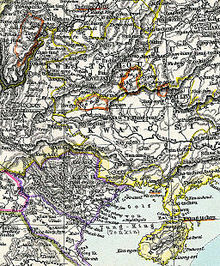 Note: The Miao areas of Sichuan province became part of the newly created Chongqing Municipality in 1997. Several thousands of Miao left their homeland to move to larger cities like Guangzhou and Beijing. There are 2,000,000 Hmong spread throughout northern Vietnam, Laos, Burma, and on other continents. 174,000 live in Thailand, where they are one of the six main hill tribes. Traditional Miao Boat used to travel down rapids for trading goods. The migration of the Hmong according to legend. According to Chinese legend, the Miao who descended from the Jiuli tribe led by Chiyou (Chinese: 蚩尤; pinyin: Chīyóu) were defeated at the Battle of Zhuolu (涿鹿; Zhuōlù, a defunct prefecture on the border of present provinces of Hebei and Liaoning) by the military coalition of Huang Di (黃帝; Huángdì) and Yan Di, leaders of the Huaxia (華夏; Huáxià) tribe as the two tribes struggled for supremacy of the Yellow River valley. According to André-Georges Haudricourt and David Strecker's claims based on limited secondary data, the Miao were among the first people to settle in present-day China. They claim that the Han borrowed a lot of words from the Miao in regard to rice farming. This indicated that the Miao were among the first rice farmers in China. In addition, some have connected the Miao to the Daxi Culture (5,300 – 6,000 years ago) in the middle Yangtze River region. The Daxi Culture has been credited with being amongst the first cultivators of rice in the Far East by Western scholars. However, in 2006 rice cultivation was found to have existed in the Shandong province even earlier than the Daxi Culture. Though the Yuezhuang culture has cultivated rice, it is more of collected wild rice and not actual cultivated and domesticated rice like that of the Daxi. A western study mention that the Miao (especially the Miao-Hunan) have some DNA from the Northeast people of China, but has origins in southern china. Recent DNA samples of Miao males contradict this theory. The White Hmong have 25% C, 8% D, & 6% N(Tat) yet they have the least contact with the Han population. In 2002, the Chu language has been identified as perhaps having influence from Tai–Kam and Miao–Yao languages by researchers at University of Massachusetts Amherst. During the Ming and Qing dynasties (1368–1911) 'miao' and 'man' were both used, the second possibly to designate the Yao (傜; Yáo) people. The Yuan, Ming, and Qing Dynasties could neither fully assimilate nor control the indigenous people. During the Miao Rebellions, when Miao tribes rebelled, Ming troops, including Han Chinese, Hui people, and Uyghurs crushed the rebels, killing thousands of them. Mass castrations of Miao boys also took place. During the Qing Dynasty the Miao fought three wars against the empire. In 1735 in the southeastern province of Guizhou, the Miao rose up against the government's forced assimilation. Eight counties involving 1,224 villages fought until 1738 when the revolt ended. According to Xiangtan University Professor Wu half the Miao population were affected by the war. The second war (1795–1806) involved the provinces of Guizhou and Hunan. Shi Sanbao and Shi Liudeng led this second revolt. Again, it ended in failure, but it took 11 years to quell the uprising. The greatest of the three wars occurred from 1854 to 1873. Zhang Xiu-mei led this revolt in Guizhou until his capture and death in Changsha, Hunan. This revolt affected over one million people and all the neighbouring provinces. By the time the war ended Professor Wu said only 30 percent of the Miao were left in their home regions. This defeat led to the Hmong people migrating out of China. During Qing times, more military garrisons were established in southwest China. Han Chinese soldiers moved into the Taijiang region of Guizhou, married Miao women, and the children were brought up as Miao. In spite of rebellion against the Han, Hmong leaders made allies with Han merchants. Politically and militarily, the Miao continued to be a stone in the shoe of the Chinese empire. The imperial government had to rely on political means to ensnare Hmong people, they created multiple competing positions of substantial prestige for Miao people to participate and assimilate into the Qing government system. During the Ming and Qing times, the official position of Kiatong was created in Indochina. The Miao would employ the use of the Kiatong government structure until the 1900s when they entered into French colonial politics in Indochina. During the founding of the People's Republic of China (PRC), the Miao played an important role in its birth when they helped Mao Zedong to escape the Kuomintang in the Long March with supplies and guides through their territory. In Vietnam, a powerful Hmong named Vuong Chinh Duc, dubbed the king of the Hmong, aided Ho Chi Minh's nationalist move against the French, and thus secured the Hmong's position in Vietnam. During the Vietnam War, Miao fought on both sides, the Hmong in Laos primarily for the US, across the border in Vietnam for the North-Vietnam coalition, the Chinese-Miao for the Communists. However, after the war the Vietnamese were very aggressive towards the Hmong who suffered many years of reprisals and genocide. Most Hmong in Thailand also supported a brief Communist uprising during the war. Some of the origins of the Hmong and Miao clan names are a result of the marriage of Hmong women to Han Chinese men, with distinct Han Chinese-descended clans and lineages practicing Han Chinese burial customs instead of Hmong-style burials. These clans were called "Han Chinese Hmong" ("Hmong Sua") in Sichuan, and were instructed in military tactics by fugitive Han Chinese rebels. Such Chinese "surname groups" are comparable to the patrilineal Hmong clans and also practice exogamy. Han Chinese male soldiers who fought against the Miao rebellions during the Qing and Ming dynasties were known to have married with non-Han women such as the Miao because Han women were not available. The Wang clan, founded among the Hmong in Gongxian county of Sichuan's Yibin district, is one such clan and can trace its origins to several such marriages around the time of the Ming dynasty suppression of the Ah rebels. Nicholas Tapp wrote that, according to The Story of the Ha Kings in the village, one such Han ancestor was Wang Wu. It is also noted that the Wang typically sided with the Chinese, being what Tapp calls "cooked" as opposed to the "raw" peoples who rebelled against the Chinese. Hmong women who married Han Chinese men founded a new Xem clan among Northern Thailand's Hmong. Fifty years later in Chiangmai two of their Hmong boy descendants were Catholics. A Hmong woman and Han Chinese man married and founded northern Thailand's Lau2, or Lauj, clan, , with another Han Chinese man of the family name Deng founding another Hmong clan. Some scholars believe this lends further credence to the idea that some or all of the present day Hmong clans were formed in this way. Jiangxi Han Chinese are claimed by some as the forefathers of the southeast Guizhou Miao, and Miao children were born to the many Miao women married Han Chinese soldiers in Taijiang in Guizhou before the second half of the 19th century. Some imperially commissioned Han Chinese chieftaincies assimilated with the Miao. Those who had "gone native" became the ancestors of a part of the Miao population in Guizhou. The Hmong Tian clan in Sizhou began in the seventh century as a migrant Han Chinese clan. The origin of the Tunbao people traces back to the Ming dynasty when the Hongwu Emperor sent 300,000 Han Chinese male soldiers in 1381 to conquer Yunnan, with some of the men marrying Yao and Miao women. The presence of women presiding over weddings was a feature noted in "Southeast Asian" marriages, such as in 1667 when a Miao woman in Yunnan married a Chinese official. Some Sinicization occurred, in Yunnan a Miao chief's daughter married a scholar in the 1600s who wrote that she could read, write, and listen in Chinese and read Chinese classics. The 2000 Chinese census recorded 8,940,116 Miao in mainland China. Compared to the Confucian principles traditionally exercised over women in the rest of China, the Miao culture is generally less strict in categorization of women’s roles in society. Miao women exercise relatively more independence, mobility and sexual freedom. They are perceived as being wild and dangerous, and actively participate in farm work, strongly labouring in the fields with unbound feet. Silver jewelry is a well-known craftwork of the Miao people. Apart from being a cultural tradition, it also symbolises the wealth of Miao women. As a Miao saying goes, “decorated with no silver or embroidery, a girl is not a girl”, Miao women are occasionally defined by the amount of silver jewelry she wears or owns. It is especially important to wear heavy and intricate silver headdresses and jewelry during significant occasions and festivals, notably during weddings, funerals and springtime celebration. Silver jewelry is an essential element of Miao marriages, particularly to the bride. Miao families would begin saving silver jewellery for the girls at an early age, wishing their daughters could marry well with the large amount of silver jewelry representing the wealth of the family. Although a growing Miao population is moving from rural Miao regions to cities, the new generation respects the families' silver heritage and is willing to pass on the practice as a cultural tradition more than a showcase of family wealth. Although Miao women’s behaviour are not strictly-governed, their social status is often seen as lower than that of men. Be it in the subsistence economy or otherwise, men are the main labor force and provide the stable source of income for the family. Women are primarily involved in domestic chores, and additionally earn supplementary income. As tourism became a major economic activity to this ethnic group, Miao women gained more opportunities to join the labor force and make their own money. Women mostly take up jobs that require an amiable and approachable personality; for example, selling souvenirs, flower wreaths and renting ethnic costumes. These jobs require persuasion and hospitality and more visibility in public, but provide unstable and insecure income. On the contrary, Miao men take up jobs than require more physical strengths and less visibility in public, such as rickshaw pulling, sightseeing boatmen and drivers. These jobs generally provide a more stable and profitable source of income. The above example of unequal division of labor demonstrates, in spite of socioeconomic changes in the recent era, men are still considered the financial backbone of the family. While the Miao people have had their own unique culture, the Confucian ideology exerted significant influences on this ethnic group. It is expected that men are the dominant figures and breadwinners of the family, while women occupy more domestic rules. There are strict social standards on women to be “virtuous wives and good mothers”, and to abide by “three obediences and four virtues”, which include cultural moral specifications of women’s behavior. A Miao woman also has more cultural freedom in marrying a man of her choice. Nonetheless, there are strict cultural practices on marriage, one being clan exogamy. It is a taboo to marry someone with the same family name, even when the couple are not blood related or from the same community. In contrast to the common practice of the right of succession belonging to the firstborn son, the Miao’s inheritance descends to the youngest son. The older sons leave the family and build their own residences, usually in the same village and close to the family. The youngest son is responsible of living with and caring for the parents, even after marriage. He receives a larger share of the family’s heritage and his mother’s silver jewellery collection, which is used as bridal wealth or dowry. Miao fish is a special way of fermenting and cooking fish by Miao people. It has been recognized as a local featured cuisine with its tasty flavor: the mixture of fish, green peppers, ginger slices and garlic, providing people with great eating experience. ^ Elizabeth M. Hoeffel, Sonya Rastogi, Myoung Ouk Kim, Hasan Shaid. (2010) The Asian Population: 2010. 2010 Census Briefs. ^ Coughlan, James E. (30 March 2010). "The countries of birth and ethnicities of Australia's Hmong and Lao communities: an analysis of recent Australian census data". Journal of Lao Studies: 55=85. Retrieved 16 July 2017. ^ Schein, Louisa. "The Miao in contemporary China." In The Hmong in transition. Edited by Hendricks, G. L., Downing, B. T., & Deinard, A. S. Staten Island: Center for migration studies (1986): 73-85. ^ a b Tapp, Nicholas. "Cultural Accommodations in Southwest China: the 'Han Miao' and Problems in the Ethnography of the Hmong." Asian Folklore Studies, Vol. 61, 2002: 77-104. ^ Yang, Kou (2010). "Commentary&58; Challenges and Complexity in the Re-Construction of Hmong History". www.ingentaconnect.com. Retrieved 2019-03-10. ^ Haudricourt, Andre; Strecker (1991). "Hmong–Mien (Miao–Yao) Loans in Chinese". T'oung Pao. 77 (4–5): 335–341. ^ Wen, Bo; Li, Hui; Gao, Song; Mao, Xianyun; Gao, Yang; Li, Feng; Zhang, Feng; He, Yungang; Dong, Yongli; Zhang, Youjun; Huang, Wenju; Jin, Jianzhong; Xiao, Chunjie; Lu, Daru; Chakraborty, Ranajit; Su, Bing; Deka, Ranjan; Jin, Li (2005). "Genetic Structure of (H)mong-Mien Speaking Populations in East Asia as Revealed by mtDNA Lineages". Oxford Journal of Molecular Biology and Evolution. 22 (3): 725–734. doi:10.1093/molbev/msi055. ^ Crawford, G. W.; X. Chen; J. Wang (2006). "Houli Culture Rice from the Yuezhuang Site, Jinan". Kaogu [Archaeology] (in Chinese). 3: 247–251. ^ "a topology table showing the hierarchy for Table 1". ^ Chih-yu Shih; Zhiyu Shi (2002). Negotiating ethnicity in China: citizenship as a response to the state. Psychology Press. p. 133. ISBN 0415283728. Retrieved 2010-06-28. ^ Frederick W. Mote; Denis Twitchett; John King Fairbank (1988). The Cambridge history of China: The Ming dynasty, 1368-1644, Part 1. Cambridge University Presslocation=. p. 380. ISBN 0521243327. Retrieved 2010-06-28. ^ Shih-shan Henry Tsai (1996). The eunuchs in the Ming dynasty. SUNY Press. p. 16. ISBN 0791426874. Retrieved 2010-06-28. ^ Elleman, Bruce A. (2001). "The Miao Revolt (1795–1806)". Modern Chinese Warfare, 1795-1989. London: Routledge. pp. 7–8. ISBN 978-0415214742. ^ Contributions to Southeast Asian ethnography, Issue 7. Board of Editors, Contributions to Southeast Asian Ethnography. 1988. p. 99. Retrieved 2010-06-28. ^ Dan Jin; Xueliang Ma; Mark Bender (2006). Butterfly mother: Miao (Hmong) creation epics from Guizhou, China. Hackett Publishing. p. xvii. ISBN 0872208494. Retrieved 2010-06-28. ^ Lee, Mai Na M. (2005). The dream of the Hmong kingdom: resistance, collaboration, and legitimacy under French colonialism (1893-1955). University of Wisconsin--Madison. p. 149. Retrieved 2010-06-28. ^ Nevison, Leslie. "In Search of a Hmong King"
^ Nicholas Tapp (2001). The Hmong of China: Context, Angency, and the Imaginary. BRILL. pp. 204–. ISBN 0-391-04187-8. ^ Narendra Singh Bisht; T. S. Bankoti (1 March 2004). Encyclopaedia of the South East Asian Ethnography. 1. Global Vision Publishing House. pp. 243–. ISBN 978-81-87746-96-6. ^ Narendra S. Bisht; T. S. Bankoti (2004). Encyclopaedia of the South-east Asian Ethnography: A-L. Global Vision. p. 243. ISBN 978-81-87746-97-3. ^ a b Tao Tao Liu; David Faure (1 March 1996). Unity and Diversity: Local Cultures and Identities in China. Hong Kong University Press. pp. 86–. ISBN 978-962-209-402-4. ^ a b Nicholas Tapp (1989). Sovereignty and Rebellion: The White Hmong of Northern Thailand. Oxford University Press. p. 169. ISBN 978-0-19-588912-3. ^ "Tunbao people spring preformance [sic]". English--People's Daily Online. February 27, 2005. ^ a b c d e f g h i j k l m n o Feng, Xianghong (18 June 2013). "Women's Work, Men's Work: Gender and Tourism among the Miao in Rural China". Anthropology of Work Review. XXXIV: 4–10. ^ a b c d e f Yu, Runze (13 October 2017). "Where women can't marry without silver". BBC Travel: 1–10. ^ "舌尖上的中国：正宗苗家古法腌鱼，可保存上10年不变质". 3g.163.com (in Chinese). Retrieved 2019-03-10. Enwall, Jaokim. Thai-Yunnan Project Newsletter, No. 17, Department of Anthropology, Australian National University, June 1992. Schein, Louisa (2000). Minority Rules: The Miao and the Feminine in China's Cultural Politics (illustrated, reprint ed.). Durham, North Carolina: Duke University Press. ISBN 082232444X. Retrieved 24 April 2014. Gina Corrigan (2001). Miao textiles from China. Seattle: University of Washington Press. ISBN 0-295-98137-7. Nicholas Tapp (2002). The Hmong of China: Context, Agency, and the Imaginary. Boston: Brill Academic Publishers. ISBN 0-391-04187-8. Nicholas Tapp; Jean Michaud; Christian Culas; Gary Yia Lee, eds. (2004). Hmong/Miao in Asia. Silkworm Books. ISBN 974-9575-01-6. David Deal & Laura Hostetler (2006). The Art of Ethnography: a Chinese "Miao Album". Seattle: University of Washington Press. ISBN 978-0295985435. Jin Dan; Xueliang Ma (2006). Miao (Hmong) Creation Epics from Guizhou, China. Translated by Mark Bender. Indianapolis, IN: Hackett Publishing Company. ISBN 978-0872208490. Thomas Vang (2008). A History of The Hmong: From Ancient Times to the Modern Diaspora. Lulu.com. ISBN 978-1435709324. Feng, Xianghong. (2013). Women's Work, Men's Work: Gender and Tourism among the Miao in Rural China. Anthropology of Work Review. 34. p. 4–10. Ch'ien Lung (emperor of China) (1810). The conquest of the Miao-tse, an imperial poem ... entitled A choral song of harmony for the first part of the Spring [tr.] by S. Weston, from the Chinese. Translated by Stephen Weston. London: Printed & Sold by C. & R. Baldwin, New Bridge Street, Black Friars. Retrieved 24 April 2014. Wikimedia Commons has media related to Miao.